Who is this mysterious SCE on poster? 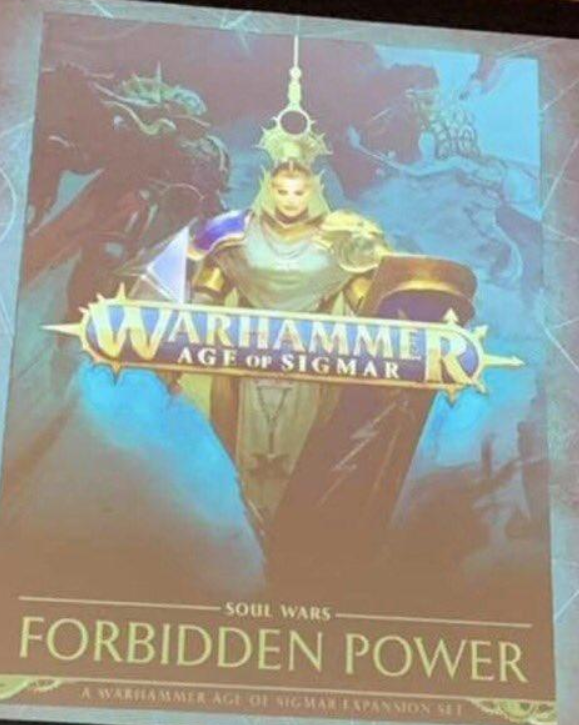 Saw this picture as 'cover for forbidden power' in rumour thread, can not find this picture at any other places so can not prove it to be true, but if it's true then this picture will be quite interesting. 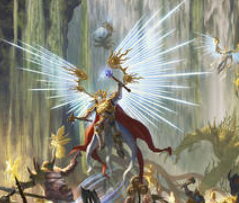 Oh I know many people will think it is just Celestant-Prime in AOH colour since it looks like that guy is flying and Celestant-Prime may be the only SCE who can duel a Mortarch. Yes, every time when the C-P appears, he always brings his big shining wings, but on this picture, the back of that figure looks quite dark. Who is this mysterious poster boy with armour of AOH and mighty enough to duel a Mortarch? 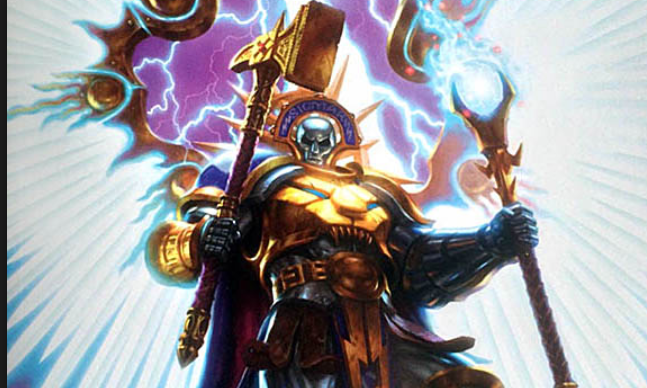 Does this mean SCE will get a new kind of lord unit or even better, a special character model for Stormhost AOH? If so, what such character can be? Lesser Celestant-Prime? 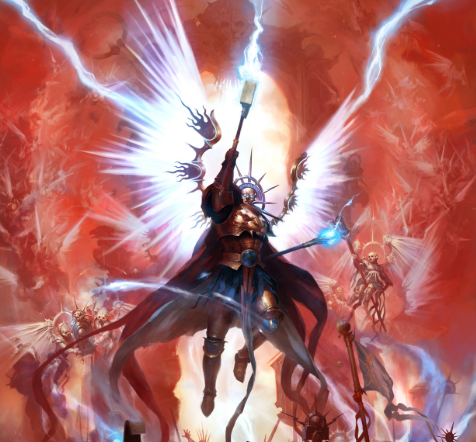 Or finally Sigmar chose a Lord-Commander for SCE? Wasn't there like a lord commander position that hasn't been filled yet? It looks like he is holding a lantern. So maybe a Lord-Castellant. (Would also fit with the helmet. And who was mentioned lately in the Background/Story as a Lord Castellant? Settrus. He would also fit to the Anvils of the Heldenhammer, who have black armour. Hm then I remembered it wrong. Is it? I mean it is sort buttom up view, so we don't see much of the face part, mostly the Helmet decoration (in that case a Lord Veritant would also be possible, but he isn't normally holding the lantern in his hand, after it is on the staff). Do we have other thinks that are hold like that (in the picture above in his right hand), rather than a lantern (and the Lord Castellant on my picture, without converting anything, is holding it in exact the same way). 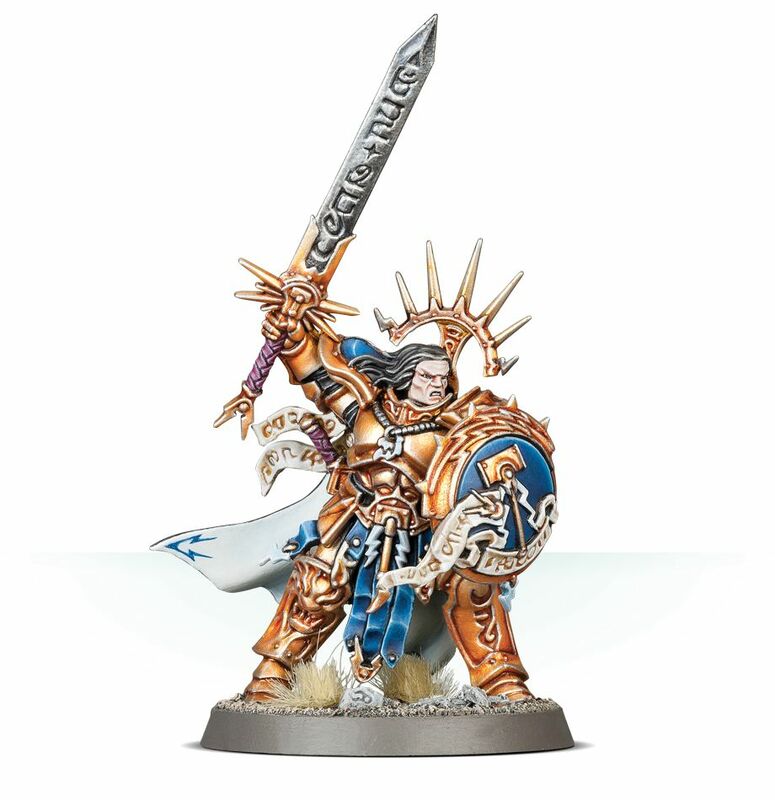 I agree, I think it is the Celestant﻿﻿-﻿Prime﻿﻿. And were are the shiny wings? And this object he is holding doesn't fit to Ghal Maraz or the Staff. The image could be 3 heralds. Chaos on left (slaanesh), order center and death on the right. Just a wild guess I know, plus that would leave destruction out. Artistic license, plus it’s hardly a good photo. Could be a lot of things, until we see it clearer. Blurry image. 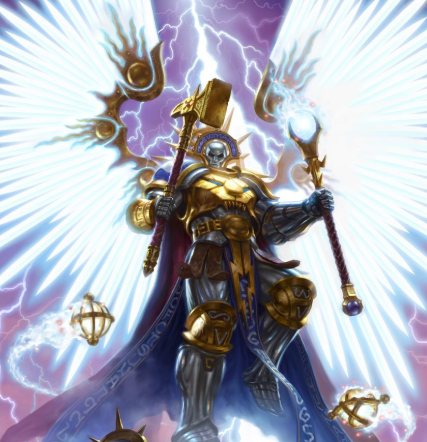 But I can see the red robes of the Celestant﻿﻿﻿﻿-﻿Prime﻿. I've seen him painted in that scheme before. Could it also be an artist impression? So not a real hint or representation of a model. Could just be like a random SC. 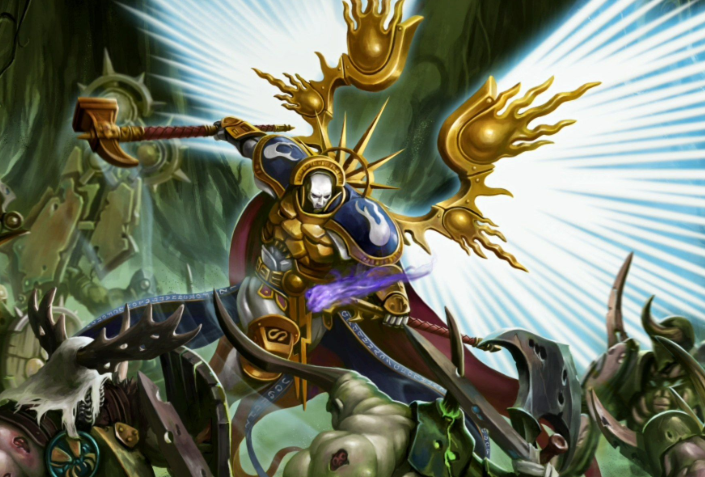 There’s plenty SC illustrations all over Soul Wars stuff, none of whom are named heroes. Ah, forgive my English, it is a bit embarrassing when I finally realized the inappropriate use of the word, thank you for the remind, edited. No problem, thanks for editing.  I should've thought that English might not be your first language, apologies for the bluntness of my post! I also think thats an artist impression or intentional decision, maybe to create contrast with lady O.